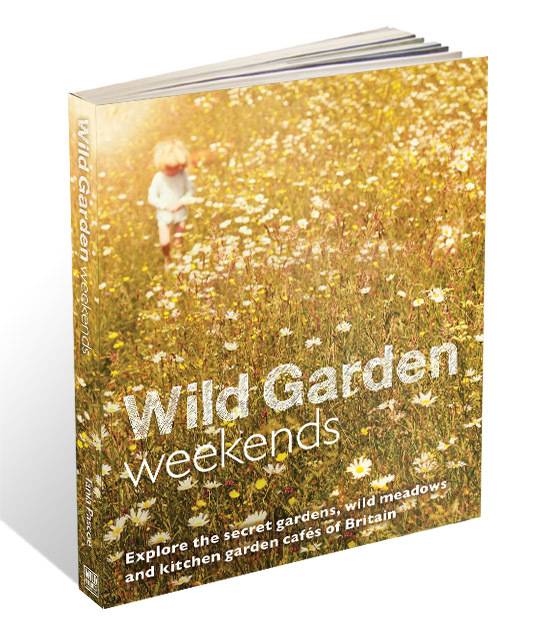 With stunning photography and illustrated maps, Wild Garden Weekends – the first guidebook of its kind – recommends nearly 400 of the best secret gardens, wild flower meadows, kitchen garden cafes and the most enchanting places to stay. If you prefer, you can also buy the Kindle or print book from Amazon here. 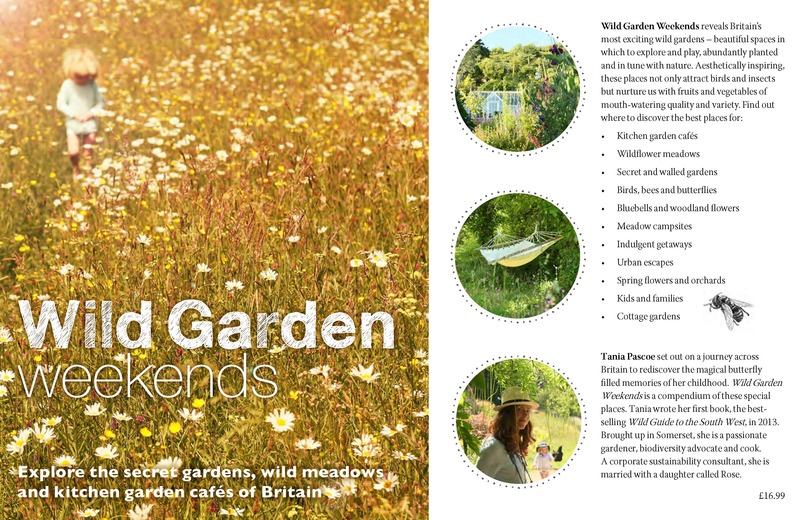 Wild Garden Weekends is an invaluable companion for weekend breaks and holidays in the UK, and is perfect for garden lovers, foodies and nature-lovers of all ages. From traditional cottage gardens and ancient orchards, to kitchen-gardens and contemporary gardens planted for bees and wildlife, Wild Garden Weekends has plenty of suggestions for year-round discovery and adventure. With 97% of Britain’s meadows lost since the 1930’s. 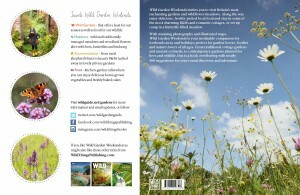 Wild Garden Weekends enables readers to explore and discover these magical wild and accessible places for themselves in an easy to follow and beautifully presented book. 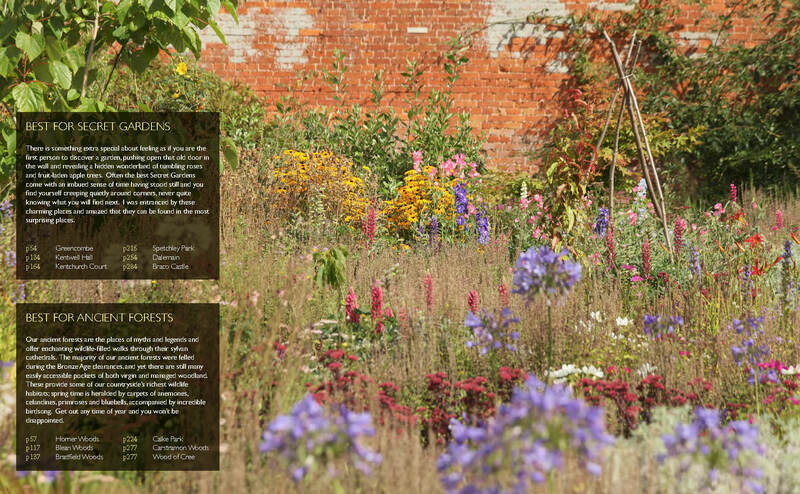 The Wild Garden movement is one of Britain’s fastest growing garden trends (Garden Media’s 2014 Garden Trend Report), and gardening is Britain’s most popular outdoor past time with 20 million garden visits per year. A former corporate sustainability consultant, Tania Pascoe set out on a journey across Britain to rediscover the magical butterfly filled memories of her childhood. 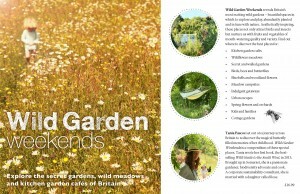 Wild Garden Weekends is a compendium of these special places. Tania wrote her first book, the best-selling Wild Guide to the South West, in 2013. Brought up in Somerset, she is a passionate gardener, biodiversity advocate and cook. She is married with a daughter called Rose. Tania is available for interview and to write features. of meadowsweet, to spend hours catching crickets or making the perfect posy of betony, daisies and clover. My background is in corporate sustainability, travelling the world selling ethical strategy and responsible rhetoric. Yet, in my lifetime, the world has lost just over half of its biodiversity – 52% since 1970 (Living Planet Report, 2014 WWF). In the UK, 97% of our hay meadows and wild grasslands have been wiped out since the 1930s (The Wildlife Trusts) and 60% of all the UK species we know about are in decline (National Ecosystem Assessment 2011). If you look at the facts, the natural world looks to be teetering on the edge. But there are also precious pockets of biodiversity that offer not only incredible natural spectacles but also seed banks, gene pools, and lessons on how we can reclaim such vital resources. These remaining fragments of our wild grasslands and semi-managed meadows – including traditional hay meadows and woodlands – are wildflower-rich landscapes that provide essential habitat and food for our insects, birds and small mammals. We rely hugely on the breadth of our species. A rich biodiversity of plants and animals, as well as healthy soils full of micro-organisms and insects underpins our food systems and our environment. Healthy ecosystems ensure our waste is broken down, our water supplies are regulated, and climate change-inducing greenhouse gases are absorbed. Traditional meadow flowers, and those that thrive in the field and woodland margins, feed our pollinators, which in turn benefit our farmland. The decline of our pollinators and biodiversity is mainly due to modern agricultural practices and the conversion of hedgerows and meadows into arable land. Before the 1930s, farming was less intense and grazing allowed, and even enhanced, a rich diversity of flowering plants. Now, when only 3% of our flower-rich grasslands is all that remains, there is still hope that we can return from the brink. From gardeners to government, we are seeing a rise in meadow appreciation. Organisations including Plantlife, the Coronation Meadows project, The Wildlife Trusts, the RSPB, and the National Trust – and many more – are protecting, restoring,and providing access to these special places. vibrant places, which offer a rare insight into the landscape and farming heritage of our not-so-distant past. 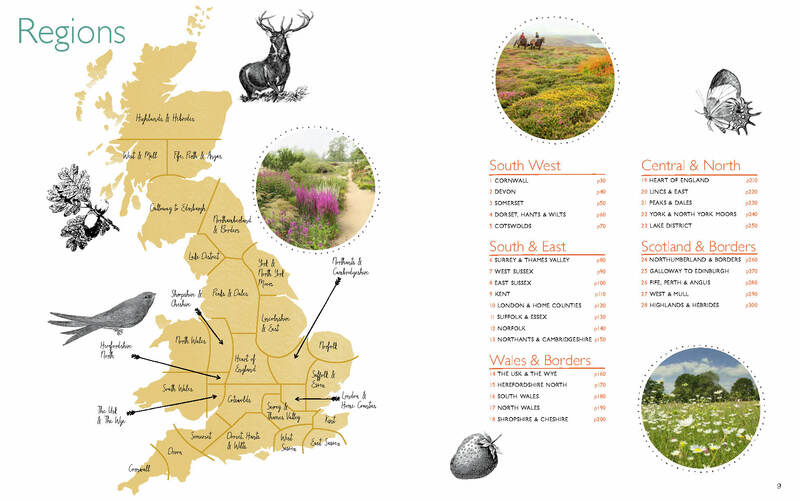 In the book you will find out where to see some of Britain’s best wildflower displays: flower-covered dunes on Scotland’s west coast (the machair); traditional hay meadows in Kent; shingle flora of Shoreham and Dungeness; and the minute alpine and arctic flora that survive high on our mountain tops. Also included are some of our island’s best woodland flower ‘shows’, often occurring in the tiny fragments of our surviving ancient woodland. These sylvan wonderlands are some of the richest, most valuable wildlife habitats in the UK. Visit in spring and you will be rewarded with mists of native bluebells, old coppiced forests carpeted with celandines, anemones, primroses and violets, and mystical oak woods dripping in lichens and mosses. part of a powerful network of wildlife habitats that nurture us as well as the birds and insects that share them. It’s heartening to see that a wild-garden revolution is growing, spurred on by our need to reconnect to nature, marvel at its wonder, reclaim its rich biodiversity, and enjoy its mental and physical health benefits. People are creating their own meadows and increasingly we are choosing pollinator-friendly plants and gardening organically, without the use of pesticides and artificial fertilisers. 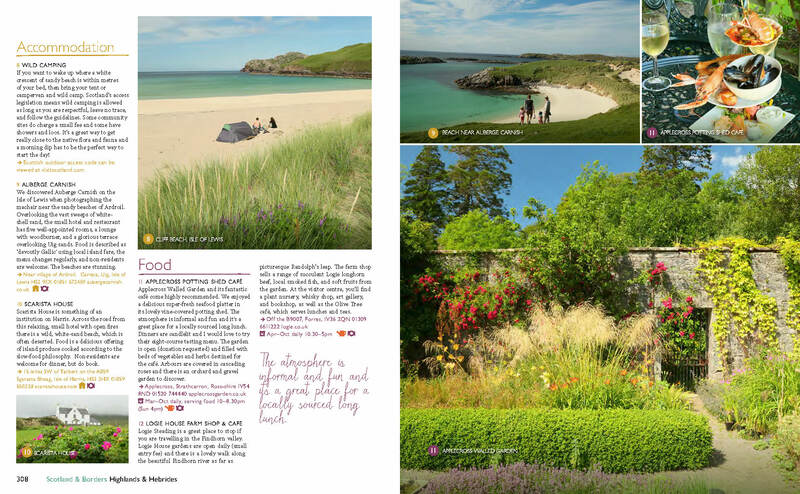 Setting out on a journey across Britain, from the Outer Hebrides to the Cornish coast, I discovered a country filled with incredible, bountiful wild gardens. Best of all, I discovered that we don’t have to give up any of the beauty, artistry and romance that our British gardens are famous for. 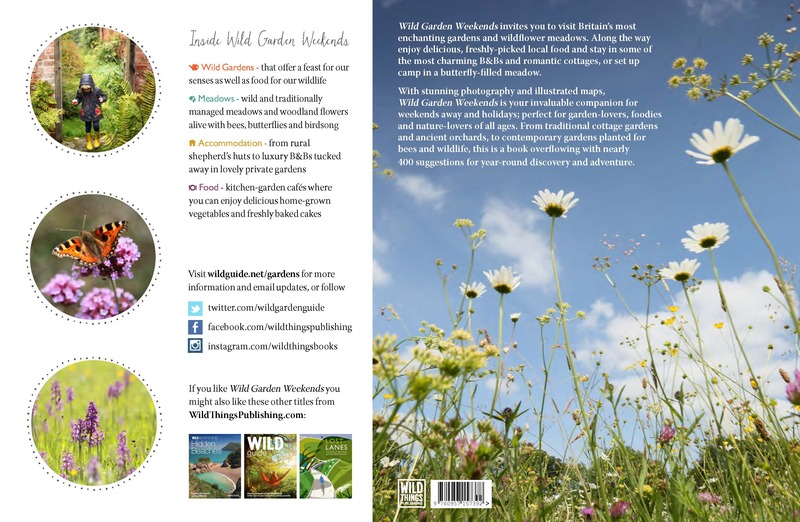 A ‘wild garden’ is arguably even more beautiful – one that audibly hums with life, planted with our wildlife in mind, and perhaps also providing us with delicious, fresh food. A wild garden is often naturalistic in feel, its design inspired by natural plant communities, and, luckily for us all, generally lower maintenance than perfectly manicured, species-poor outdoor spaces. Seeing so much beauty is hungry work, and with friends and family, I ate my way through some incredible home-made cakes,garden-fresh salads, quiches, soups and gourmet six-course meals. book contains a hand-picked selection of characterful, charming places set in wild flora-filled landscapes or lovingly tended gardens. You can camp in a traditional orchard in Cornwall or rent a rustic cottage set in its own small nature reserve in Pembrokeshire. There are farmhouse B&Bs, quirky boutique hotels, gypsy caravans, and yurts with wood burning stoves – all just waiting to be sampled. All the entries in the book offer a taste of the good life, the good food and the beautiful places that our little islands are blessed with. I hope you find joy, solace and inspiration in discovering them too.